A photo book is the perfect product to collect, keep, and present digital memories, resulting in the perfect gift and keepsake. However, people often think creating a photo book is complicated, difficult or (even worse) time consuming. We will show you that this is no longer true and you can create a photo book directly from your iPhone - easily, fast, and effortlessly. To create a photo book more efficiently, start by selecting and organizing your photos in an album on your iPhone's Photos app. You can add more photos later if needed. 6. Now you are ready to start building your photo book. You can create an account or continue as a guest. We strongly advise you to create an account, so that you can continue working on your photo book any time from any device. 7. Printiki supports photos from various sources, like your camera roll, Facebook and Instagram. We will now choose to upload photos from the camera roll. Tap on Upload. 8. Tap on Photo Library (to access your camera roll and albums). 9. Tap on an Album or on Camera roll. We have already organized our favorite photos in an album, so if you're following our tips, go with album. 10. Tap on the photos you would like to upload to your book. 11. To fill your book automatically, tap on Build book. 12. Your photos are now uploaded to your book that gets automatically filled with all your great memories. If you love the result as it is then you are already done! We like to personalize the book a bit, so we're going to edit it. 13. Tap on the page you wish to personalize and tap Edit. There is a variety of editing tools available. Let's check a few of them. 2. Scroll to choose your favorite font. Drag and drop the font to the preferred position on the page. 3. A text box will automatically open. Type your text. 4. You can change the font type, color, background color, size, and alignment. These functions are all available in the toolbar at the bottom of the page. *** Go back anytime to pages overview by tapping Back on the top left of your screen. 2. Select a template by tapping it. 3. You can recenter your photo by tapping and dragging them. Or change one of the photos by another one that suits the template better by tapping Change photo. If necessary, you can zoom in or out your photos and centralize them on the page. You can also add a border to your photos, choosing from a variety of colors. 4. See in the example below, page 13 is now 12. 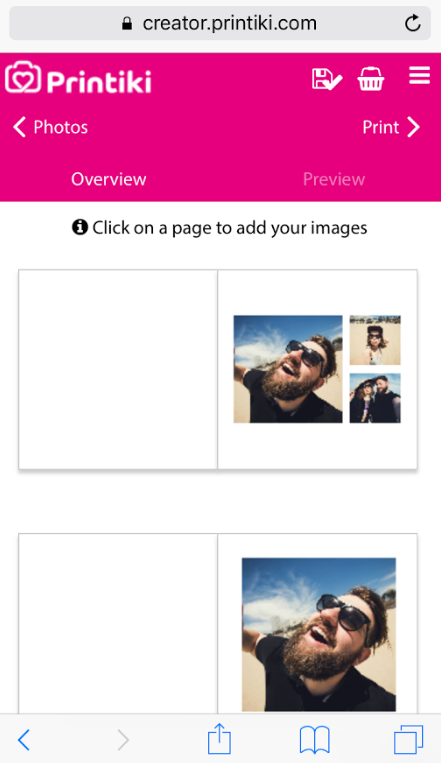 Printiki's creator allows you to connect to your Instagram, Facebook, Dropbox, One Drive and Google + accounts, and upload photos directly from these profiles to your photo book. Let's see how it works with Instagram. The instructions are the same for all the other sources. 1. From the book pages overview, tap on Photos in the top left. 2. Tap on Instagram, or any other source you'd like to connect. 3. Tap on Connect with Instagram. 4. Your Instagram feed will load automatically. Tap on the photos you would like to include in your photo book. 5. Tap on Proceed. Your photo's comments will be included by default. You can turn this function off by swapping the yes button to left. 6. Tap on Build book. 2. Flip through your book pages by tapping on the blue button. You can edit any page any time by tapping on the page. After previewing your photo book and making the necessary changes, you are ready to order it! 4. See your order summary. Tap on Checkout at the top right to insert your details or tap on +Add item to add another Printiki product. Now you just need to insert your details, choose shipping and payment method. Within few days your photo book be delivered at your address. 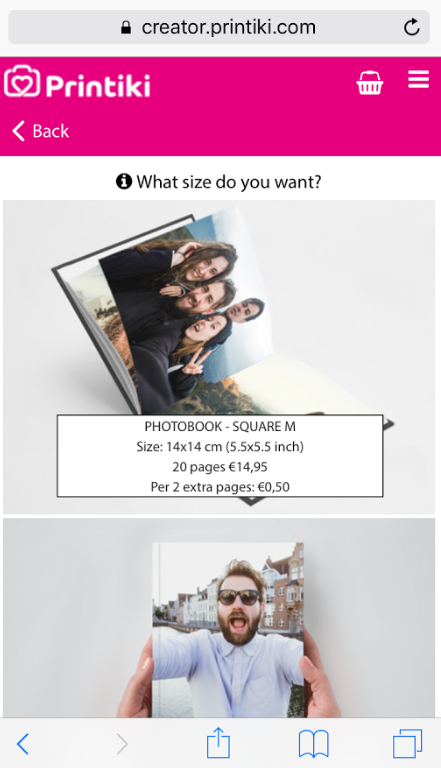 Would you like to show your photo book to your friends? Awesome, because Printiki makes it easy for you! First, tap on the Facebook or Twitter icon. After, tap on Share and let your friends see all pages of your photo book. From our payment confirmation page you also get easy access to our blog and our referral program!